lbbat2, originally uploaded by jahansell. I found this little fellow, lifeless, in my garden yesterday. 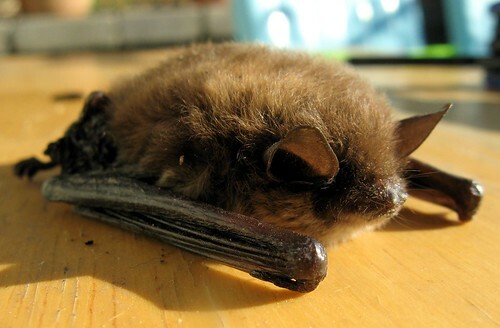 I think it's a Little Brown Bat - he (or she) was about 3 inches long. There is a big bat die-off around here for unknown reasons - this bat didn't have the white fungus around its nose that is the common characteristic of those that are dying off. It seems that they are coming out of their caves too early, before there are any bugs around to eat. (They eat 50% of their weight every night in insects!) I opened its wings and was entranced by how delicate yet strong they are - they are two filmy layers of nearly transparent membrane. I put a few more pictures from different angles on my flickr site - you can see its feet, and the strange claw that grows from the elbow on the front leg. After photographing it my daughter and I gave it a nice burial - right next to Ursula the cat! What a poignant photo. I remember saving a little creature years ago that appeared on my property thru a wildlife rehabilitator in Torrington. She was wonderful. Oh my. I just read about the bat die off on the news on the computer this morning and now I get to see one. I hope this is the end of them dying. What a shame. Those creatures are so beneficial to mankind. Thanks for stopping and commenting on my blog. I couldn't figure this out from the small post page. I'm not really fond of bats (although I know I should'nt be), but this is sad. Thank you for posting that photo. I was googling to see photos of "Little Brown Bats". I took a photo, the other day, of a live bat. Since it is now April, hopefully, my little bat will stay alive. I think my bat is the same type as yours. ok. you people do know these things can and often do carry rabies, don't you? it is possible to contract the virus even if you aren't bitten!!! hello! Actually, that's not true. While they CAN carry rabies, they don't "often" have this disease as you stated. In fact, it's quite rare that they do. And you won't contract rabies simply by touching it or handling it. It's transferred via saliva. So, unless you're bitten by an infect mammal, you will be fine.